Gorgeous CUSTOM BUILT LOG HOME in one of a kind setting situated on level park-like lakefront retreat has 300+ feet of waterfront, western facing with amazing sunsets. The stone pillars & iron gates leads you to this lakefront PARADISE. Warmth of wood & stone welcomes you to the open floor plan with soaring ceilings & walls of windows. The massive great room has 2 fireplaces, vaulted ceilings and a wall of glass leading you to the 33 x 8 covered porch with lake views. The expansive WO lake level has an INDOOR SYLVAN GUNITE POOL & SPA, HEAT SAUNA & has additional space that can be easily finished access to the 6 CAR GARAGES and plenty of storage. 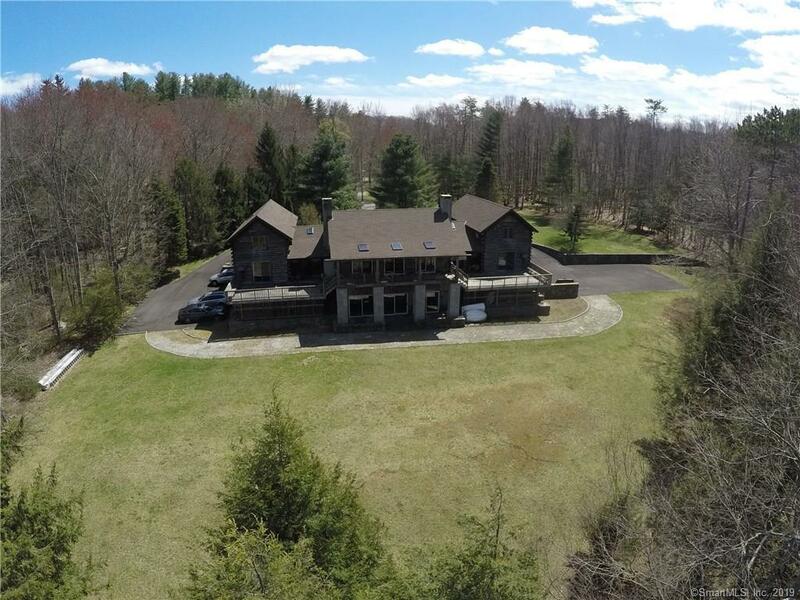 Situated on 2+ level acres of privacy. This log home is ideal for collector or hobbyist. New Roof and skylights 2016, New furnace and water tank 2012. A special waterfront retreat to call home. THIS HOME OFFERS expansion potential in upper levels can easily be finished to add 1400+- SF, plumbed for heating, roughed in electric and flooring available. UL - Right side 42x17, UL left 42x17 of UNFINISHED SPACE is plumbed for heating, rough electrical, plumbed for bath on each side, can easily be complete to add an additional 1400 SF of living space to the home. (700 Sf on each side)., HOME DETAILS: 4 BEDROOM SEPTIC, CENTRAL VACUUM, wall unit AC throughout, HOUSE INTERCOM THROUGHOUT, NEW FURNACE AND WATER TANK 2012, NEW ROOF 2016, 10 NEW SKYLIGHTS 2016, NEW OIL TANKS 2008, 2 ON EACH SIDE OF HOME, 2 FOR HOME, 2 FOR POOL, GENERATOR HOOK UP. New garage doors, 2 double, 2 single, 6 CARS TOTAL. EXTERIOR LIGHTING. Handsome stone pillar and iron front gate, extensive paved driveway, plenty of parking. Great room wired for ceiling mounted projector and 2 large screens already in HOUSE OFFER ENDLESS EXPANSION POTENTIAL in Upper levels - Right side 42x17, LEFT side 42x17 of UNFINISHED SPACE is plumbed for heating (radiators included), rough electrical, plumbed for bath on each side, can easily be complete to add and additional 1400 SF of living space to the home. (700 Sf on each side). place. The LAKE LEVEL, offers a gorgeous INDOOR HEATED SYLVAN POOL WITH SPA, HEAT SAUNA, sliders to cover patio overlooking the expansive 300+- feet of waterfront bordered with field stone walls. Plumbed for full bath, access to the 6 car garages, room for expansion potential near the pool area. The private waterfront site has mature trees and level yard. Underground electric from street to home.